Talk about coincidence. 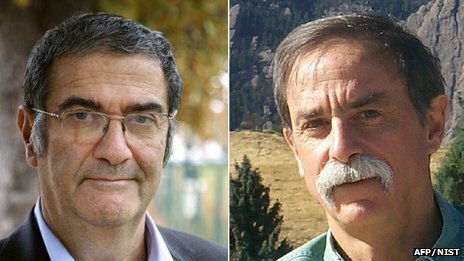 To sort of kill my boredom, I was rereading Programming the Universe by Seth Lloyd and I found out that Serge Haroche from College de France and David Wineland from National Institute for Standards and Technology have won this year’s Nobel Prize in Physics. The Nobel citation states the award was for “ground-breaking experimental methods that enable measuring and manipulation of individual quantum systems”. So, a second Nobel for Quantum Optics in seven years. My congratulations are in order for both Dr. Haroche and Dr. Wineland. The news motivates me even more to finish my write-up on Quantum Entanglement. Lets reboot with a strong passion of mine, Theoretical Physics. At the clinic, I was approached by a young patient who wanted to know more about Quantum Mechanics. We had a very interesting conversation today and that brings me to this post. You see, I am mostly self-taught in Theoretical Physics. Professionally, I did a one year Advanced Diploma in Theoretical Physics in a top research school. But, as I had mentioned earlier, I couldn’t get into a Doctoral Program in Physics, since, most rejection letters cited the fact that I had done Physics only for one year. Although disappointed, I carried on with my work in Theoretical Physics. 1. A Unified Grand Tour of Theoretical Physics by Ian D. Lawrie. A very important aspect of any textbook in Theoretical Physics is the introduction and establishment of core concepts of Modern Physics. The book should deal with Relativity theories, Quantum Mechanics, Quantum Field Theory, Cosmology, Statistical Mechanics, to name just a few. In this regard, the book comes out with flying colors. The book is structured and well presented. A grasp of classical mechanics, thermodynamics and elementary quantum mechanics is required to appreciate this book in its entirety. The presentation is lucid and impressive. If you wanna begin learning Theoretical Physics yourselves, this book is a must read. 2. The Road to Reality. If anyone is deeply interested in Physics and doesn’t know the name Roger Penrose, then there is something amiss! Penrose is one of the most original thinkers of our time. All his books are mind blowing and so is this one. Although the book covers all important aspects of Modern Physics, it is completely unique in the fact that almost one-third of the book is focused on Mathematics. Theoretical Physics would not work without the Math. For the interested , this book is extremely important. Penrose’s style is well known and he doesn’t disappoint. All in all, this is a must read book as well for anyone interested in Theoretical Physics. 3. Feynman’s Lectures on Physics. Feynman was a magician in the league of physicists. There is only one Feynman! This compilation is probably the most well known amongst the three books. You will not be disappointed when you read this book. Trust me, you will come out completely enlightened. Don’t think twice about buying this book. Note: Owning these books a religious experience. Whenever I am down, I tend to reread one of these books. Money spent on these books is more than worth it. As far as FLP is concerned, the editor of the Millennium Edition informed me that a digital version of the book is currently under preparation.